These are Chandra X-ray Observatory images of the centers of two globular clusters, NGC 6397 and NGC 6121, located in the Milky Way galaxy. They are part of a new study that shows globular clusters might be surprisingly less mature in their development than previously thought. Globular clusters are dense bunches of up to millions of stars that are among the oldest known objects in the Universe. Conventional wisdom is that they pass through three phases of evolution or development of their structure, corresponding to adolescence, middle age, and old age. These "ages" refer to the evolutionary state of the cluster, not the physical ages of the individual stars. 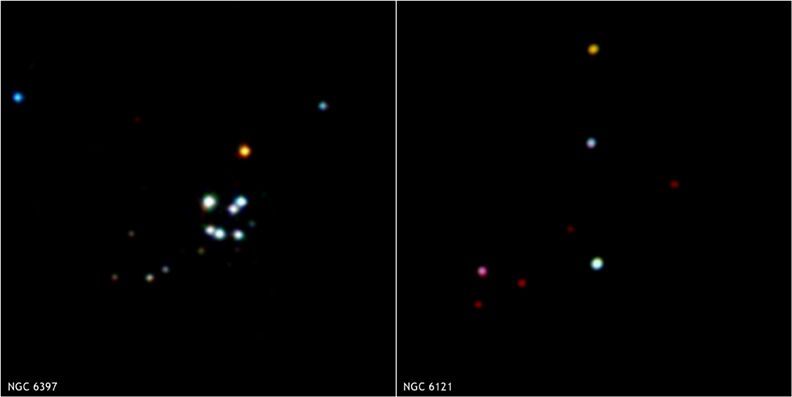 The X-ray sources in these two globular clusters are a product of their environment. The centers of globular clusters are so crowded that single and double stars can interact, resulting in the formation of double stars that transfer mass and give off X-rays. Since such double stars are expected to mostly be formed in the middle of a globular cluster’s evolution and then lost when the cluster gets older, the relative number of X-ray sources gives clues about the stage of evolution the cluster is in. The number of double stars - and bright X-ray sources - in a globular cluster also depends on the encounter rate near the center of the cluster. NGC 6397 has a lower encounter rate than NGC 6121, so it should have fewer X-ray sources, assuming that it is in the same stage of evolution. Instead, NGC 6397 has a clear surplus of X-ray sources, suggesting that it is in a more advanced stage of evolution (middle age) than NGC 6121, which appears to still be in adolescence. The general conclusion of this new study is that most globular clusters, not just NGC 6121, may be in the adolescent stage of their evolution, rather than middle age as previously thought. Also, the few globular clusters, like NGC 6397, previously believed to be in old age may actually only be in middle age. A total of thirteen globular clusters were included in the study, ten that appear to be in adolescence and 3 that appear to be middle-aged. Chandra is well suited to studying double stars in globular clusters because its unparalleled spatial resolution and sensitivity allows it to isolate large numbers of X-ray sources. Optical observations are not as useful for accurate censuses of double stars in globular clusters because tens or hundreds of thousands of bright single stars are also detected in optical images, making the isolation of double stars in close orbits less efficient and reliable. 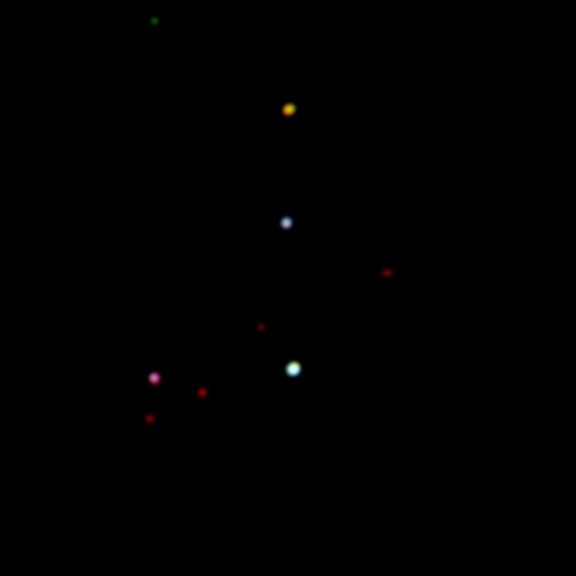 Coordinates (J2000) RA 16h 23m 35.50s | Dec -26° 31' 31.10"
Coordinates (J2000) RA 17h 40m 42.20s | Dec -53° 40' 23.70"